South Korea proved to be a tough and fast opponent with excellent goal keepers, who drove Croats mad with their precision. SPLIT, CROATIA - With the spectacular opening in Split's Spaladium Arena, the 21 st World Handball Championship began which will include performances of 25 national teams from all over the world. Croatian handball players will open the championship with a math against South Korea, which is characterised by great speed. Everyone hopes Croatia will easily win against South Korea, but they should approach the match with caution, since their game styles are quite different to the ones Croats encounter. The World Handball Championship has caused great interest in the world and the matches will be broadcast in 155 countries, which will have a chance to learn more about Croatia. The reports of the WHC have surpassed those of the World Championship in Germany, when the signal went to 143 countries, the Slobodna Dalmacija daily writes. South Korea opened the match, with an error in the attack. The ball is Croatia's and the home team takes the lead with Zrnic scoring. However, the advantage did not last ling, because Korea equalised in the next attack. Igor Vori scores 2:1, while Zrnic fails to take Croatia into lead, missing a goal. Korea misses in another forward, which Croatia punishes from the 7-metre line, after a foul on Vori. Cupic scores. Jungge Park reduced Croatia`s advantage to one point. However, this did not last long because Buntic scored for the hosts` 2-point advantage. Mateo Hrvatin scores for 5:3. Korea looses the ball and Croatia has a shot at greated advantage, but Vori errors in attack and the ball is Korea's. Korea then punishes Metlicic˙s miss and reduces th eresult to a 1-point difference. Another foul on Vori and Cupic is again precise. Alilovic defends again, but Vori and Zrnic loose the ball, thus Korea catches up with Croatia to a goal of difference. Croatia has a hard time scoring, but does so nevertheless. Duvnjak enters the game instead of Balic. Korea equalises after Vori loses another ball in the attack. Domagoj Duvnjak makes an effort and briefly took Croatia in the lead, but it did not last, because the fast Koreans equalise at 7:7. Balic scores his first goal for Croatia. Losert replaces Alilovic on the ggoal and already defends Korea's first attack, giving a chance to his players to get a 2-point difference, but Lackovic fails to use it. However, Zrnic scores from a counter-attack, 9:7. Losert defends again and young Duvnjak scores a cannon-like shot for a 3-point difference. Jaewoo Lee reduced this result. Zrnic fails to score and Korea comes back to a 1-point difference. Croatian players have poor effect in attack and Korean goal keeper Park has managed to collect six defences. Korea equalises after a player was left alone on the line and goal keeper Losert did not stand a chance. For the first time, Korea takes the lead as Yoon scores. Croatia's Cupic scores from the 7-metre line and rescues Croatia, which not equalises. J.B. Sim takes things a step back and Korea takes the reins, but in the next attack, Duvnjak follows with his third goal and equalises the score, until the next Korean attack. Ivano Balic scores for 13:13 and Lino Cervar calls the time-out before the end of the first half. At the very end of the first half, Tonci Valcic scores after Hrvatin hit the Korean goal keeper. Croatia has a 1-point advantage. Croatia starts the second half with a goal by Cupic, who is precise from the 7-metre line. Korea has a chance at scoring from the same 7-metre line for the first time, and succeeds. Hrvatin scores from the wing and the hosts are again in the lead with a 2-point difference. Alilovic defends after Lee made a long pass, because the referees raised their hands due to passive attack. Alilovic`s forth catch. Balic tried to surprise, but Korean goal keeper defends and Croatia receives a goal at 16:15 after a counter attack. Cupic scored from the game and the result is 17:15 for the hosts. Korea`s response came promptly. Korea then equalises and has the attack with a chance to be in the lead, but Alilovic defends the attack and does not allow the Koreans to score. Croatia has a chance in creative a solid advantage, because Korea is a player short. 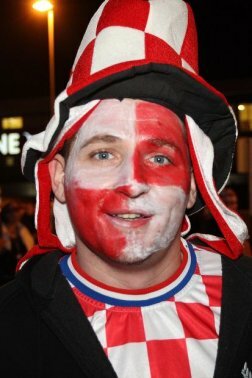 Hrvatin scores for Croatia, which is his second goal of the match. Igor Vori scores for a two-point difference from the game. Zrnic misses and Korean goal keeper Park edges his 11 th catch of the night. Croatia is one man down as Anusic is out for two minutes. Korea uses this opportunity and J.G. Park reduces the Infernal Ones` advantage. Croat Igor Vori then sets the result at 21:19. Korea again has a man down, Taewan Kim. Cupic scores one more time, setting the score at 22:19. Y.K. Yeong scores after the balls bounced off Croat goal keeper Losert. Vori heads the Croatian attack, scoring for 23:20. J. G. Park scores and reduces Korea's backlog, while Croatia is a man short for two minutes, because Anusic is out of the match. Duvnjak made an effort, but the goal keeper is too precise. Croatia`s Venio Loser defends a 7-metre shot. Jaebok Sim scores at 23:22 and Korea is a serious threat for the hosts of the World Handball Championship once again. Nine minutes before the end of the match, the result is 23:23. Igor Vori of Croatia misses and Korea takes the lead. Korean attack encounters an error and Croatia has a shot at equalising. Blazenko Lackovic breaks through the Korean defence, but fails to score and this is Croatia`s third attack without results. Venio Losert defends, but Korean goal keeper Kang catches two Croatian attempts. Two goals of advantage at just five minutes before the end of the match. The best Croatian player Ivan Cupic reduces Korea's lead and Igor Vori equalises after breaking free from three guards. Y.S. Oh sends the ball to the Croatian goal through Losert's legs, returning his team's advantage. Petar Metlicic chose the right time for his first goal of the match and the score is 26:26. Croatian team captain Petar Metlicic did not stop at just one goal and he scores for 27:26, which is also the final result of the match.